The low cost Moto G handset from Motorola can now boast the very latest version of Android KitKat as part of its excellent value proposition. The update hit European versions of the handset this weekend and can be downloaded over the air directly from the device. 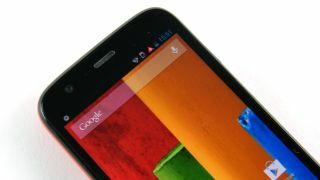 It comes just days after Vodafone pledged to release the device on contract packing the Android 4.4.2 update. Within that report we speculated whether Vodafone had earned dibs on the KitKat update, but now we know that's not going to be the case. Having Android KitKat gives potential suitors yet another reason to snap up the 4.5-inch 720p device. The handset is available off contract for the modest price of £179 and brings with it a 1.2GHz quad-core Snapdragon 400 processor and 1GB of RAM. The Moto G may be joined in the UK by its big brother, the Moto X, this week with a London event planned for Tuesday.